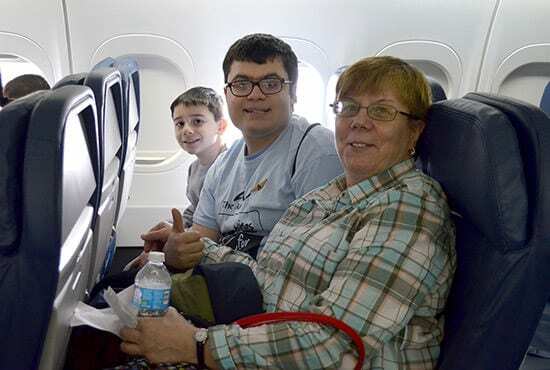 Going to the airport can be a traumatic experience for anybody, but for children with autism and other intellectual and developmental disabilities, the long check-in lines, constant noise, and cramped cramped conditions of airline travel can present special challenges. 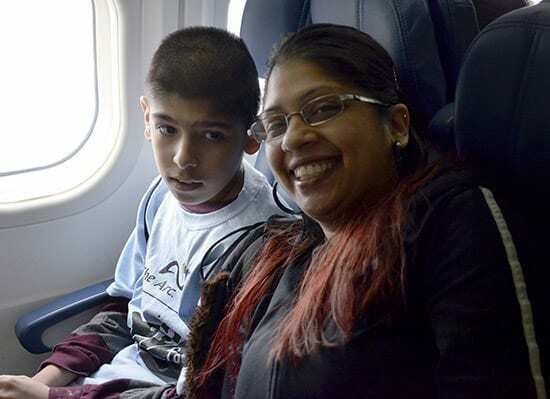 The Arc’s Wings for Autism program was developed to provide families with an airport rehearsal experience that allows them to undergo the steps of checking in at the airport, going through security, and boarding an airplane. Opportunities to practice these steps can help families to find ways to reduce the stresses of of travel for their loved one with a disability. 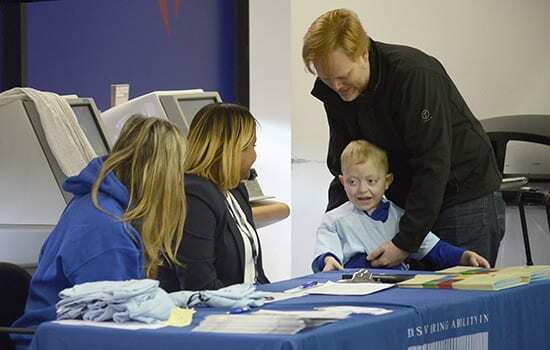 On Saturday, April 9, 2016, families and staff from AHRC New York City‘s schools gathered at LaGuardia Airport to participate in Wings for Autism. This was the second consecutive year in which families from AHRC NYC’ schools benefited from the program. 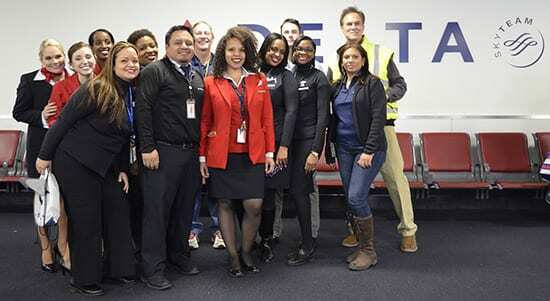 AHRC NYC and The Arc partnered with the Port Authority of New York and New Jersey, the Transportation Security Administration, and Delta Airlines to help families to get the wheels off the ground. 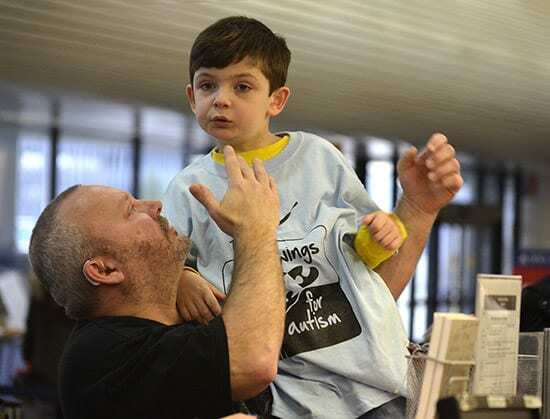 “A lot of families of kids with autism are intimidated by the airport process, because there are a lot of sensory experiences, a lot of crowds, there are delays that are unpredictable… which are all things that in many cases can disrupt someone with autism’s life,” said John Goodson, Training Director for AHRC NYC’s Educational Services, during an interview with Newsday, which covered the event. The families arrived at LaGuardia at 11:00 am, greeted by volunteer staff from AHRC NYC schools, who assisted them during the check-in process. 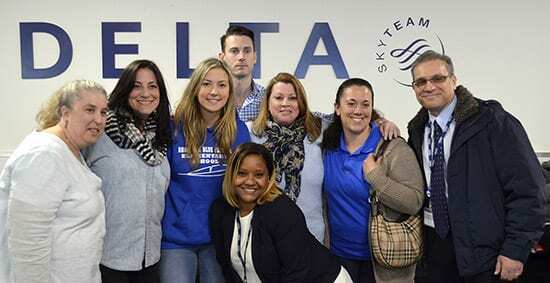 With specially-designed boarding passes provided by Delta Airlines attendants, families were directed to the security gate, where they practiced the security protocols that are so familiar to people who frequently travel by air. Prior to boarding, Delta provided snacks and trinkets to families in the waiting area. “We travel quite often, so it’s a good opportunity to come out here,” said Andreas Chrysostomou, whose son, Costas is a student at AHRC Middle/High School. “It’s very organized. This is what they should expect to see when we come to the airport.” Costas smiled continuously as he boarded the plane. Omar and Amber Chandler had never been to the airport before, let alone get on a plane (Omar is an MHS student). “We just wanted to see how it is,” Omar said. “It’s good,” Amber said. “I like mostly everything.” Upon departing the airplane both flashed a thumbs-up. Students and families then boarded the Boeing 737, complete with a flight crew and pilot. After settling in to their seats the crew gave a typical pre-takeoff demonstration and played some Disney trivia over the intercom. AHRC New York City would like to thank Brian Rohlf and Joanne Feltman of the Port Authority, TSA’s Veda Simmons and Guy Lainis, Delta’s Jorge Chuzan, Caitlin Davis of The Arc, and all of the Delta staff at LaGuardia Airport, for helping to coordinate Wings for Autism and once again, making it a great success. We also thank all of the AHRC NYC staff who volunteered their time to assist the families.